I'm so happy I was able to make this. I've had the pattern for 3 1/2 years, so this makes me happy! How cute!! Yes, I was also thinking" Nightmare Before Christmas"! Nice work! It makes me think of Jack Skellington... lol. I must make one in white, too! Cute, you could also make it in orange with yellow eyes etc for a jack-o-lantern for Halloween. What is it? 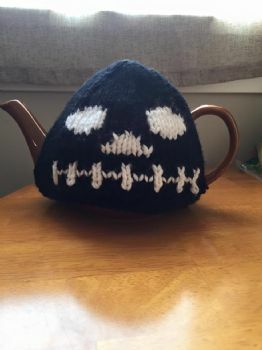 I know that it is a tea cozy but what is the face?